The "River of Gold" originates near Mt. Shisha Pangma in Tibet, and runs eastwards in Nepal through the great Mahabharat Lekh range. It forms the watershed for the most of eastern Nepal. Gathering strength from tributaries draining the highest mountains in the world, it emerges onto the northern plains of India where it joins the Ganges. Together they wind down to the Indian Ocean. It is one of the longest river journeys Nepal has to offer. Starting from Dolalghat, on the Arniko highway, the river makes its way to the Gangetic plains. 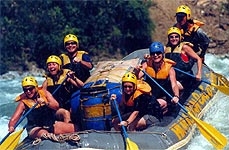 The 8 -10 day trip has many rapids that test your skill and at the end it is a rewarding experience. From the put-in at Dolalghat to the take-out at Chatara, the warm waters of the Sun Kosi surge 270 km through some of Nepal's most remote countryside. Leaving behind the trappings of civilization we must rely totally on our own supplies and experience. As we flow along soaking up the sunshine farmers still use centuries-old techniques to cultivate their land. To run the Sun Kosi just after the Monsoon must rate as one of life's most exhilarating experiences. At this time of the year the river is high and wild, and definitely not for the faint-hearted. Whipped foamy white where narrow gorges constrict the river's flow the cataracts are long and powerful. This is big volume whitewater at its best. Swept along by the pulsing waters we're soon maneuvering through narrow boiling channels and dodging obstacles. The river dances through corridors of lush forest then accelerates through leaping waves and roaring drops. There are dozens of adrenaline-pumping rapids, and miles of calmer water to reflect on the beauty of this remote area. The first few days are not difficult and prepare us for the harder rapids below. Meatgrinder, High Anxiety, Jaws, Harkapur II, Roller Coaster, and the Big Dipper are only some of the rapids that have earned their names and reputations from previous expeditions. Nine days of constant whitewater, time spent exploring villages, jungle, and some of the small Hindu temples along the way make this a classic river expedition. 01 Drive to Dolalghat (2½ hrs); paddling demonstration and safety talk; start rafting (Camp). 02-08 Rafting and exploring the Sun Kosi (Camp). 09 Finish rafting at Chatara mid-afternoon; drive to Kathmandu (15 hrs).